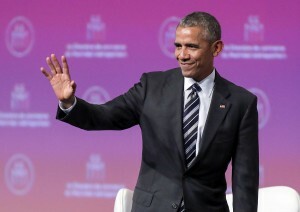 Barack Obama gave a widely-anticipated speech in Montreal today. With all due respect to Barack Obama — and he deserves a lot of respect — that statement goes way too far. It’s one thing to encourage more gender parity, and better representation for women and minorities in politics at all levels. On this we agree entirely. It’s another thing to assign false stereotypes to female politicians and assume that because of them, women would automatically make better leaders than men. Marine Le Pen. Theresa May. Sarah Palin. Indira Gandhi. Imelda Marcos. Eva Peron. Dilma Rousseff. Margaret Thatcher. Kellie Leitch. Pauline Marois. I could go on here. Women aren’t automatically more compassionate, wise, nurturing, caring, insightful, or resistant to corruption. I suspect that we have these qualities in roughly the same proportion as men do. And politics inherently elevates the ruthless, the corrupt, the power-hungry and the populist, while chewing up and spitting out the idealistic, the competent and the well-intentioned. Most of the corrupt, terrible leaders have been men, but that’s just because most leaders in history have been men, period. If and when the glass ceilings disappear, I suspect we’ll have just as many terrible female leaders as we do male ones. We may be hoping for a Michelle Obama, and end up instead with an Ivanka Trump. Or, for that matter, a Claire Underwood. That’s not to say those glass ceilings oughtn’t be shattered. Of course they must. But we must demand better from ALL our leaders — male, female or otherwise.